1. Start early if you can: Yes, death is at most times unexpected, but if you have a loved one who is getting older and/or happens to be hospitalized, it’ll make the process easier. Most funerals are planned in a few short days, so you’ll need to make the most of your time. 2. Take notes: Ask friends and family of your loved one of their favorite stories involving them. It’ll allow you to maybe hear some stories you’ve never heard before, while the sharing of stories will help to process your grief. It’s doubtful that you’ll use all your notes, but it’s good to have it all down that way you know if you need more information elsewhere — maybe in their childhood possibly. 3. Keep it written: Write down your thoughts or things you want to make sure that nothing is forgotten. Keep a notepad by your bedside, in your car — keep one in your shower if you can, we all know that’s where the best ideas come from. 4. Keep it personal: The eulogy is about the person and who they were during their time with the living. Don’t be afraid to try to capture their essence. Don’t talk about how they worked at GM for 50 years, talk about how their favorite experience was teaching their grandchildren to fish, or how they would always give the kids a sucker when they came to visit. We are our experiences and memories, not the other way around. Make sure to shape the eulogy after the person they were, not what they did. 5. 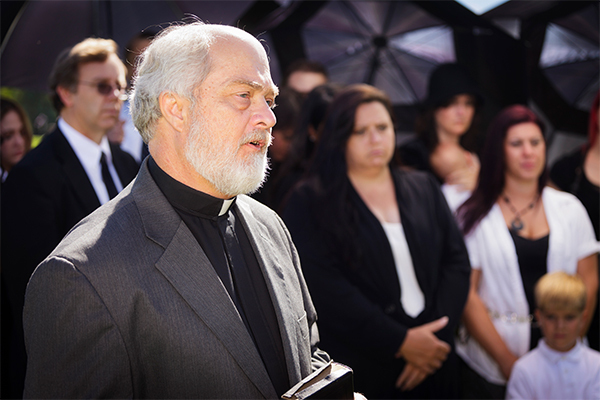 Make it positive: Funerals are a sad experience to begin with, so try to keep the overall tone positive. Don’t focus on the fact that they contracted cancer at the ripe age of 28. Focus on how they never let life take them down, how they always smiled no matter what was going on around them. 6. Rehearse: This one should come as a no brainer, but you need to practice. You’ll be talking about some very emotionally draining things. While rehearsing you’re probably going to cry, and that’s okay. You’ll have to practice pushing through these pangs of grief, to continue delivering a memorable eulogy. 7. Make it personal: Everyone at the funeral has some connection to the deceased, so make sure to address them while giving your speech. Eulogies are for the living, not those who have moved on. Don’t be afraid to make eye contact or point out those who may have shared in a particular experience when going through a particular funny or enjoyable memory. Even with these tips, eulogy writing is no easy task. You’re working through the stages of grief while trying to honor your loved one’s memory. Hopefully these tips can help to give you a guideline that’ll allow you to give the eulogy your loved one deserved!